Giveaway: Entenmann's Little Bites | The Food Hussy! I have been a long-time fan of Entenmann's Little Bites. Their tasty mini-muffins and brownies are one of my favorite treats to pack in my lunch, as well as my husband's. This year they partnered with TerraCycle to help bring awareness and ideas on how to do your part for the world this Earth Day (April 22, 2014) and even learn how Entenmann's packages are turned into really neat reusable lunch bags. 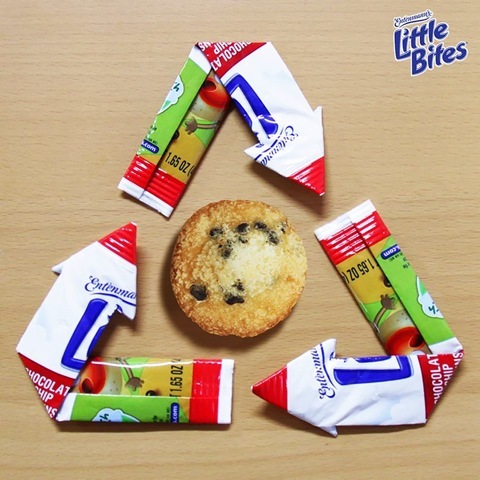 Little Bites joins an established national TerraCycle Brigade recycling initiative that currently has 38.5 million participants in the US, and has paid out $6 million to charitable organizations and schools for waste collected through its Brigades programs to date. The company has collected over 2.6 billion pieces of garbage, recycling all different types of waste from used drink pouches to tooth brushes to water filters. Entenmann's Bakery, a division of Bimbo Bakeries USA (BBU), has partnered with TerraCycle, an international leader in the collection and reuse of non-recyclable post-consumer waste, to launch the first-ever Little Bites “Recycle…Reuse… Replenish” Fully Recyclable Lunch Earth Day awareness campaign and sweepstakes. The Little Bites “Recycle…Reuse…Replenish” campaign is aimed to educate consumers on how to recycle Little Bites Pouches and turn trash into cash for schools through the point redemption process. The unique partnership with TerraCycle demonstrates Entenmann’s dedication to recycling and reducing the amount of Entenmann’s Little Bites pouches that end up in landfills each year. The recycling and upcycling experts at TerraCycle are committed to creating new lives for Entenmann’s Little Bites pouches by taking the used packaging and turning it into innovative new products, while awarding points for schools that can be redeemed as cash for every Little Bites pouch received. 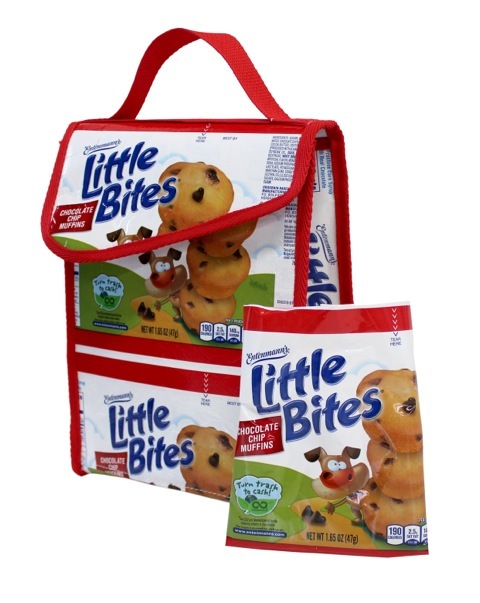 Click this link to Visit the Little Bites Pouch Brigade Page on the TerraCycle website. Recycle Check-it: look for numbers and recycling symbols on plastics to know what types get reused. Not sure what to do with your Little Bites pouches? Now you can recycle them with the TerraCycle program and sign up for your school if they are not already. Check out what other lunch items TerraCycle recycles. Reuse Put your sandwich in reusable lunchbox container to take home and use over again. Before you toss anything away, stop to think about ways you might be able to use it again. TerraCycle’s team of designers makes products out of wrappers and packaging. Check out more ideas. Replenish Have any leftovers from lunch? Before you throw away, make sure to check out what biodegradable foods can be brought back home to be added to a compost pile. Make a compost at home! Be sure to include the three basic ingredients: Browns (dead leaves, branches, twigs, cardboard, newspaper), Greens (grass clippings, vegetable waste, fruit scraps, coffee grounds) and Water to make an effective outdoor composting area. Check out more info from the Environmental Protection Agency (EPA). 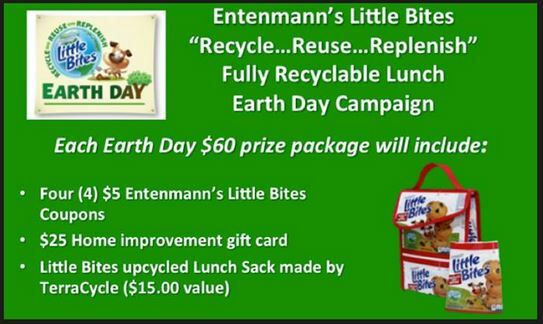 Starting on March 1st, Entenmann’s will be rewarding lucky winners with an assortment of weekly prizes including Little Bites coupons, upcycled Little Bites-branded Lunch Sacks made by TerraCycle, $25 Home Depot Gift cards to start an Earth Day garden and a $5,000 cash grand prize through a sweepstakes link on the Entenmann’s Facebook page. All entries must be received by 11:59: p.m. ET April 30, 2014. Official Rules can be found on their website. This giveaway is open to US Residents, ages 18+ years of age. Simply follow the Rafflecopter form below for your chance to enter and win. Limited to one entrant per household. This giveaway ends on 04/14/14. Good Luck.